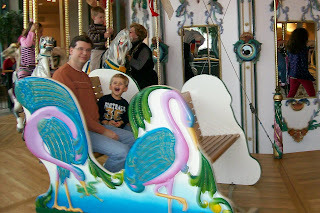 A picture of Randy and Dawson riding the carousel at The Woodlands Mall. The bench has been his seat of choice recently. Stephanie was at the one in Kingwood last week during their Thanksgiving sale. I think she bought $100 worth of items for the boys, but ended up paying only $60 after her multiple coupons! Yes, we love Children's Place! They have such cute clothes, really good quality, and great prices.